Camels are nasty creatures, never mind that serene, dopey look that appears in peaceful pictures. They are bad tempered and have really ugly teeth. On the other hand, they are surprisingly smooth-riding, and quiet. They don’t have hooves, so they don’t clop on pavement. We learned all this stuff when we went for a camel ride in Cairo, hard by the Sphinx and at the feet of the three greatest pyramids in Egypt. The way you get on is you climb into the saddle of a recumbent camel while the camel pilot maintains control, and while his camel tries to bite you. 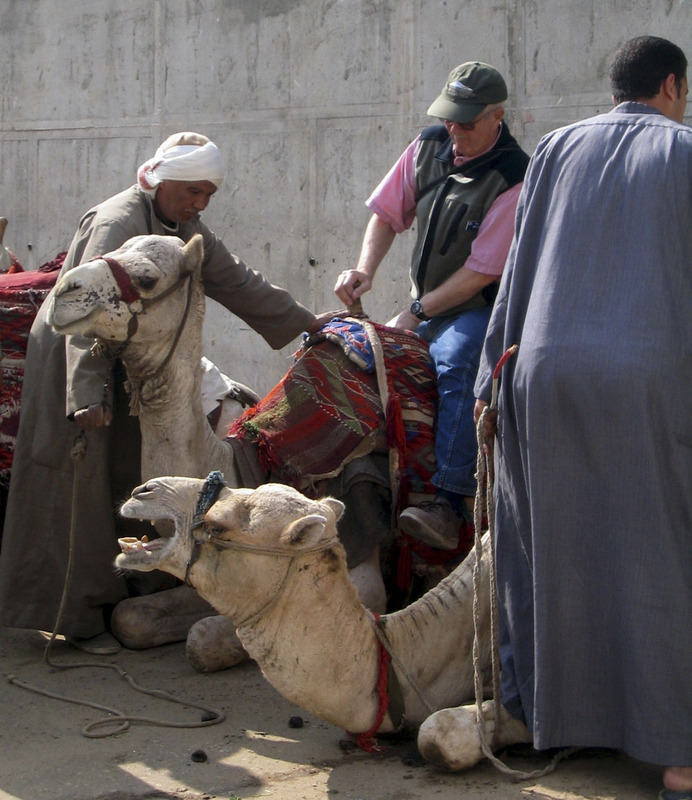 Once aboard, and with a good hold on the saddle (which has easy-to-grip horns fore and aft) you lean back while the stern of the camel arises, and then hang on tight while he gets his front legs aligned. Now you are ready to ride your camel. We did it with a guy on the ground holding a rope with the camel at the end of it. The pros hold their own ropes while riding, but I am not clear on how they steer. Our tour of the Nile consisted of a whole lot more than camel-riding though. It was sponsored by Lindblad Expeditions (www.expeditions.com), but these tours are big business with many operators. Tour boats park several abreast at docks along the river, so that passengers must walk through two or more extravagant boat lobbies as they go to or from their boats and busses. Our room on the boat was large, with big windows and comfortable beds. The food was good, but the water undrinkable. Comfortingly, the company provided abundant bottled water and, in an uneasy part of the world, the Egyptians are determined to keep their country safe for tourists. The Nile originates in the rainy African interior, and its lush flood plain lubricates and nourishes one of the earliest, longest lived, and best documented civilizations our planet has known. Tombs and temples and monuments chronicle an astonishing 6000-year history of kings and prophets, and even engineers and doctors (dentistry and even brain surgery were performed successfully by Egyptian practitioners thousands of years ago). A week-long cruise along the Nile, including tours to museums, tombs, and other points of interest with experienced and knowledgeable Egyptian guides, can only provide a sense that not only are we lousy camel-riders, but that our grasp of world history needs a lot of work. Whole libraries are dedicated to Egyptology, but the tour and a study of the excellent summary of Egypt and its history in the National Geographic magazine of April, 2001 were a good beginning. Published 1/17/07 in IL Postcards — this article is no longer for sale.